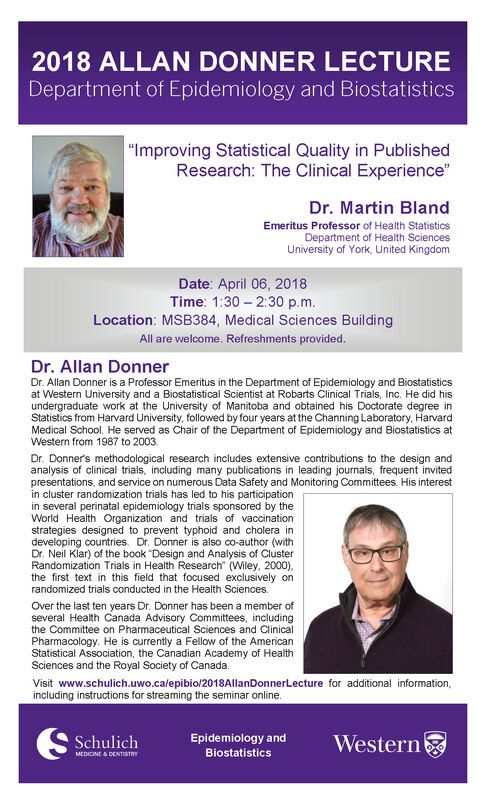 The 2018 Allan Donner Lecture: "Improving Statistical Quality in Published Research: The Clinical Experience"
Dr. Martin Bland joined the University of York as Professor of Health Statistics in 2003, retiring and becoming Emeritus Professor in 2015. Earlier posts were at St. George’s and St. Thomas’s Hospital Medical Schools and in industry with ICI, working on agricultural experiments. He is the author of An Introduction to Medical Statistics, now in its fourth edition, and co-author of Statistical Questions in Evidence-based Medicine, both Oxford University Press, 297 refereed journal articles, and, with Prof. Doug Altman, the Statistics Notes series in the British Medical Journal. He and Doug Altman also invented the limits of agreement method for comparing methods of measurement, which led to the most highly cited papers in six different journals and one of the top 30 most highly cited papers over all fields. Unable to attend the seminar? 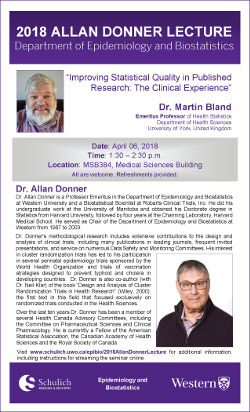 On April 06, at 1:30 p.m. click this Guest Link to view the seminar online, in real time, via Blackboard Collaborate. View the complete Seminar Series Listing. View information about our Named Seminars.